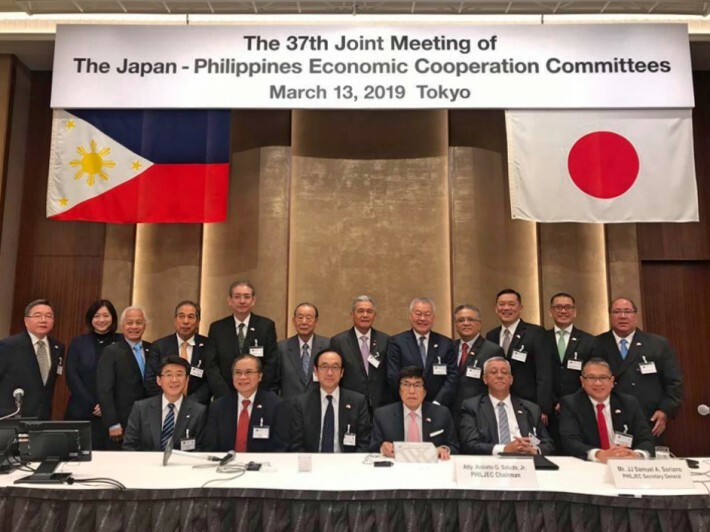 The Philippines-Japan Economic Cooperation Committee, Inc. (PHILJEC) met with its Japanese counterpart, Japan-Philippines Economic Cooperation Committee (JPECC) for their 37th Joint Meeting held last March 13, 2019 at the prestigious Tokyo Kaikan. This year’s joint meeting highlighted the two nations’ strategic economic partnership in key industries specifically, tourism, transportation, human resource, construction, and manufacturing. Mr. Shinya Katanozaka (JPECC) and Atty. Aniceto G. Saludo, Jr. (PHILJEC) Chairmaan and Co-Chairman respectively of the 37th Joint Meeting welcomed all participants with their opening remarks. Congratulatory messages from Prime Minister Shinzo Abe of Japan and President Rodrigo R. Duterte of the Philippines were read by Ambassadors Koji Haneda and Jose C. Laurel V, respectively. The Philippines’ Trade and Industry Secretary Ramon M. Lopez and Transport Secretary Arthur P. Tugade were this year’s Keynote Speakers. Mr. Takashi Sasaki – Special Advisor, JTB Corp.
Mr. Isao Hosoya – Executive Officer, Tokyo Gas Co., Ltd.
Mr. Shuichiro Yoshida – Assistant General Manager, Marine Safety Division, Mitsui O.S.K. Lines, Ltd.
Mr. Kentaro Ozawa – Executive Director of International Business, Human Holdings Co., Ltd. The PHILJEC Delegation consisted of 74 delegates, one of the largest ever assembled for a Joint Meeting held in Tokyo. The night before the Joint Meeting, the visiting Filipinos were invited to a Welcome Dinner for the Philippines-Japan Society at the Imperial Hotel hosted by the Philippine Society of Japan led by Mr. Mamoru Sekiyama, Chairman and Ambassador Makoto Katsura, President. On the other hand, JPECC hosted sumptuous lunch and dinner at the Tokyo Kaikan during the Joint Meeting.